If you go to a Woody Allen movie you can rely on several things. Jazz, jokes and angst. Sometimes the angst is extreme (BLUE JASMINE and INTERIORS jump to mind), sometimes it is purely comic. 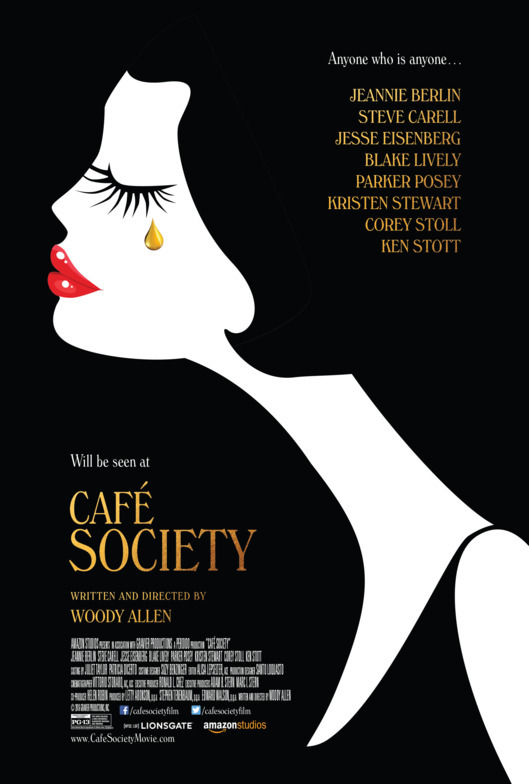 CAFE SOCIETY falls toward the comic end of the spectrum and with a cast that is new to the Allen oeuvre. Jesse Eisenberg is Bobby Dorfman, the youngest of three siblings who grew up the children of a jeweler in Brooklyn. Bobby has bigger aspirations and goes to Hollywood seeking a job with his Uncle Phil (Steve Carell), the big Hollywood agent. He meets Vonnie (Kristen Stewart), his Uncle’s secretary and is smitten. But Vonnie is seeing someone else. She tells Bobby that her boyfriend is a journalist. That’s not true, but I’m not going to spoil that. Matter of fact that is all I can reveal of the plot without spoiling the whole thing. If you are a fan of old school Woody Allen, this you will enjoy this immensely. The slightly angst-ridden protagonist, the overly specific Jewish family, lots of sexual innuendo, romance and disappointment. There are writers who’s dialogue is instantly familiar. Aaron Sorkin, David Mamet and Wes Anderson are three. You could be blindfolded in a dark room and just hear their words and know who wrote what. Allen is the another. The smart-aleck tone to everything. The reverence for romanticism. The hopefulness in every disappointment. And of course the humor. It is familiar and fun and I could watch his movies forever. The cast is wonderful. Eisenberg is the heir apparent to Allen’s nebbishy neurosis. Stewart continues to impress with every role that distances her from The Twilight movies. Carell is rock solid. Corey Stoll is wonderful as Bobby’s hoodlum brother and Jeannie Berlin and Ken Stott are the wonderfully stereotypical old world Jewish mother and father. CAFE SOCIETY is not deep, nor poignant in any real way. But it is nearly flawless. It is a testament to Allen’s genius as a filmmaker. If you have 95 minutes to kill, you cannot find a better way to occupy that time than by watching this film.